Patrick Callaghan stood on the stage, soaking up the adulation. He flashed his expensive smile at the assembled social climbers. Judging by their couture cocktail dresses and tuxedos, they could afford to donate to his campaign. With their dollars in his coffers, he could really take the fight to McCarney. His gaze swept the hall as the thunderous applause continued. His gaze fell on a woman near the back of the room. Black hair tumbled around her pale shoulders, and a slender hand held an unlit cigarillo. Melanie. Patrick gulped. He’d recognise that figure anywhere. The last time he saw it, he was eight years younger and watching her climb out of his Renault. She walked away into the rain, and never looked back. The evening’s host stepped forward, taking the microphone. He launched into a rapturous speech about Patrick’s incandescent rise through the political ranks, prompting yet more applause. Patrick tuned the speaker out, stealing glances between smiles for the crowd. Moments later, his campaign manager swept him off the stage, and he lost sight of his Ghost of Christmas Past. Patrick hung up and scribbled himself a note to get Simpkins to send his wife some flowers. Maybe forget-me-nots, if they were in season. Patrick whirled around. Melanie leaned against the door. Patrick gulped, and wondered how long she’d been there. “I’m in town for the horticulture convention. I saw you were speaking and thought I’d drop by. It was a wonderful speech,” she replied. She smiled that gorgeous smile of hers, and his tense nerves relaxed. “I like it well enough, but it’s a bit of a drag. I don’t know what to do this evening. Where’s a girl to go for some fun?” Melanie’s green eyes glittered as a wicked grin flashed across her face. “If it’s fun you’re after…” Patrick grinned back. Why not? I’ve been working hard these past few months, I deserve a reward. “We always did have such fun, didn’t we?” asked Melanie. “My hotel isn’t far.” Patrick smiled. He called his assistant. Simpkins arrived with the car, and drove the couple to Patrick’s hotel. He heard himself telling Simpkins that Melanie was an old friend and had some useful information about McCarney. Melanie smiled and said nothing. She still said nothing when he opened the door to his hotel suite. A knot of unease tightened in Patrick’s stomach. Hey, maybe I’m just nervous. It’s been a while since that intern. He leaned down to kiss her, hoping to break the tension. Melanie ducked out of the way, placing one finger on his lips. “Why don’t you sit yourself down on the bed? I’ve got a surprise for you,” she said. Melanie slipped out of her jacket and dropped it on the floor. She looked up at him, her intent blazing in those stormy eyes. The knot in his stomach loosened and Patrick perched on edge of the bed. “How have you been, P-Bear?” asked Melanie. She peeled off her elbow-length gloves and tossed them aside. Patrick frowned at the mention of his wife, but Melanie’s gyrating distracted him. “I always liked Felicia. She was always so kind to me. Of course, she just thought I was the gardener. She never suspected a thing, did she?” asked Melanie. Melanie stopped dancing and glared at him. A rattle in the closet fought for his attention, but he couldn’t stop staring at Melanie. “We….have a son?” he asked. Visions of tabloid headlines and judgmental news reports flashed through his mind. The rattling grew louder and Patrick glanced at the closet. The door bulged as though something behind it wanted to get out. “Why are you here? Why are you doing this? Do you want child maintenance?” asked Patrick. “I suffered in silence until I started seeing you on the news. It’s taken me months to get an invite to one of your functions,” said Melanie. Her green eyes glowed, and the air around her crackled with invisible electricity. The closet door burst open and a skeleton lunged into the room. It took a swipe at Patrick, its bones whistling through the air just inches from his face. A second skeleton burst free, followed by a third. “What are you doing?” screamed Patrick. He scrambled away from the bed. Two more skeletons emerged from the closet. The first skeleton advanced across the room and sunk its fingers into his hair. The skeletons fell upon Patrick, hauling him onto the bed. Melanie’s cackling was the last thing he heard as the skeletons ripped him apart. Sign up below to get a free copy of Harbingers, my collection of weird and dark short stories. 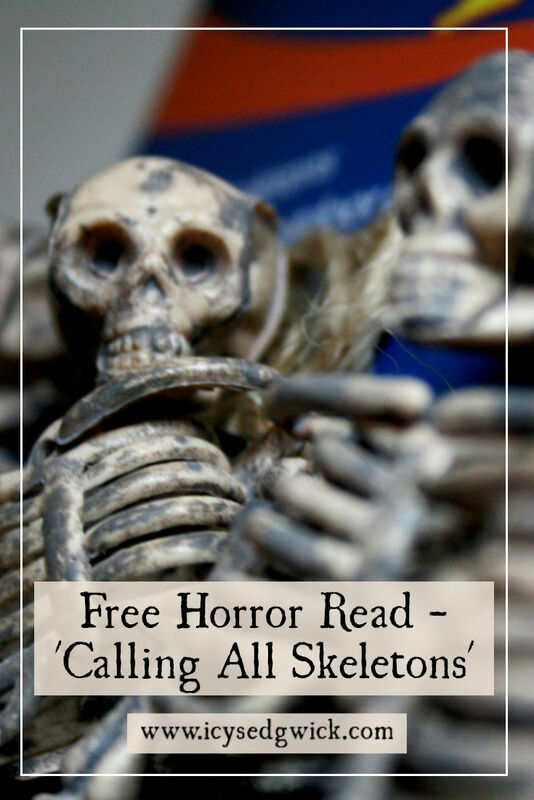 Or click here to read Skeletons, another of my bony tales. 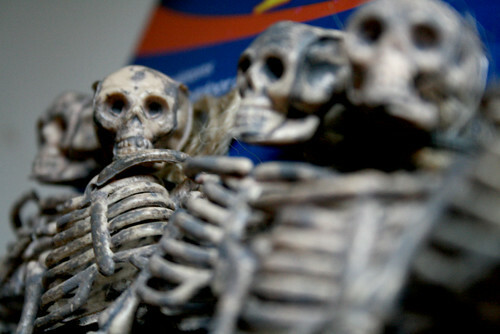 Learn about skeletons in folklore. Or listen to the song Calling All Skeletons by Alkaline Trio here, which inspired this story. Would you like more folklore and weird tales? Add your email to get them once a month, and receive this free copy of my short story collection too! Send my free copy please! With their dollars in his coffers, he could really take the fight to McCarney – brilliant way to bring opening paragraph to an end. Such Intrigue! “Who’s Ethan?” asked Patrick. – fantastic timing, Icy. Skeletons, re-appearances. The misdirection of the “always had fun/gyrating” to take us along the fling route was just enough to suggest. Impressive. Totally engaging and great that the skeletons in the closet finally get to do something useful! Really good pacing, build up. Nice tension and rhythm throughout. And I really liked “You made your bed…time for you to die in it.” too. I’m confused by the reference to McKane. Should that have been McCarney? Another cracking tale, Icy. Great pacing and misdirection as the others have said, and I really enjoyed how Melanie’s control/relationship with the skeletons is left ambiguous. It’s nice to see a politician get their comeuppance properly once in a while. Ian – I think I *may* have been slightly influenced by the whole Arnie saga. Alison – I think it says a lot about me that I think there would be ACTUAL skeletons in the closet!! Tim – Yes, you’re right – I changed the names while writing and like a pillock forgot to change them all the way through! Changed it now though. Sam – I just thought, I probably shouldn’t have named him in case Patrick wanted to take out a super injunction! Fantastic. Was not expecting it to go in that direction at all. Think it is a well-rounded story as it is but could also be the beginning of a novel. Had a sort of Fringe/Tales from the Crypt feel about it. They say there is some truth in all sayings and nursery rhymes so why not this one? Besides, of all the undead I’ve always felt skeletons are woefully under represented … outside Ray Harryhausen film’s that is! A compelling flash indeed. This was smooth Icy. I liked this. The literal version of skeletons in the closet. Fantastic descriptions. Well-done. Really well written, Icy. Patrick got what he deserved … loved the riff on “skeletons in the closet”. Makes me wonder about Ethan, though … hmm. What a cool take on having skeletons in the closet. Beautiful set up and delivery. And now we know what the skeletons do when they finally get out of the closet. A great story, Icy. This guy had it coming to him. Everyone else has said it already, but I too loved the imagery. Skeletons in the closet, becoming the chickens come home to roost. And a philandering politician gets his just desserts. What’s not to like? I, too, loved the skeletons in the closet. A guy like that, though… he would tend to accumulate them more than a more honest man. Well done Icy. I think I’m really getting a feel for your voice and I like it. Haha. Also, yes to the animated skeletons in the closet. Too funny. That’s kharma, baby! Another great piece by the lovely Icy. Fantastic! Your flashes always are. Loved the title and how it plays into the story. Perfectly told. I’ll think of this story every time I hear that skeletons in the closet phrase now. 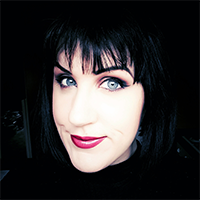 Henrietta – I LOVE Fringe so I’m cool with that! Marc – Glad you liked it. Jason – Well the phrase must’ve come from somewhere. So I’m bringing back mummies AND skeletons…what next! Peggy – I love thinking literally. Janet – Hopefully he won’t be as vindictive as his mother…or disloyal as his father! Poor bugger doesn’t stand a chance. Stephen – He’s a rather unpleasant sort, isn’t he? FAR – Closest I’ll get to satire – and it’s got reanimated skeletons in it. Tony – Methinks there would be far more than five! John – Heh, you got the Arnie reference. Deanna – I just pity the maids in the morning! Danni – Yep. This stuff comes back around! Storytreasury – Glad you liked it! Chuck – In my head, I see the skeletons from the White Stripes’ Seven Nation Army video! A really good tale, I liked that his actual skeletons in the closet came back to bite him so to speak. I also liked the pace of the piece, it kept me reading waiting to see what would happen. Good ending, very enjoyable story. MUahahahahaha! Sorry, this story just brings out the evil laughter in me. That was fantastic, Icy! The last line was PERFECTION! Your tension build had my heart pumping and it wasn’t just the strong coffee. As Sam said, just “crackling!” Loved it! Some people have more skeletons in their closet than others, eh? Good story! Liked how you’ve connected politicans to their actions in such a dramatic and vengeful way. I kept waiting for the skeleton to jump out and get him-very suiting that there was more than one in he closet. Mari – This story wanted to be longer but I think it picked up pace because I had to cut things out. Steve – I don’t know why but I seem to keep coming up with movie oneliners at the moment. Michael Bay should hire me…couldn’t make his scripts any worse. Cathy – Hurrah for evil laughter!! Eric – I bet he’s got a few more, too! Lara – I dread to think what the others were for! Love the skeletons, they made me laugh… you built this really well! The ending began to remind me of the Dominique Strauss-Kahn news recently. I loved the way this turned dark and Melanie gets her revenge. Clever word-play with the skeletons. I initially thought Melanie was a ghost (but she seems less a ghost, since she seems to be caring for her child). I’m so gald to be back in the world of writing again after by brief sojurn in ‘Real World’, because it gives me time to read your fantastic stories. This one is great in all the right places and who doesn’t enjoy a dirty rat having a taste of his just desserts? Did i mix metaphors there? Aieee – I’m not sure what’s more horrific, Melanie’s liberal use of the moniker ‘P-Bear’, or releasing a wild herd of skeletons into the room. Either way, he made ’em, he deserves ’em. You do the ‘skeletons in the closet’ theme justice. 🙂 I have to admit, I was just waiting for this guy to get what he deserved. I was not disappointed!